The Kingston MBA course offers an intensive, stimulating and challenging learning experience that will provide you with a broad foundation of knowledge in the main management disciplines. In addition, it will allow you to reflect on your professional practice and personal development, and lay the foundations for assuming a senior strategic role in your organisation. We've been delivering a high-quality MBA programme for 25 years, which now incorporates a first class full-time and part-time programme starting in September and February. This course has been AMBA accredited for most of that time – meaning you can rely on us to provide a high-quality MBA experience. 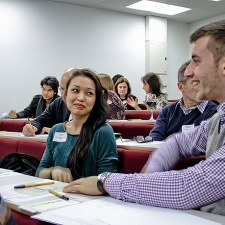 Our MBA briefings provide you with an excellent opportunity to find out all you need to know about our facilities, staff and students and have a look at our unique study support materials.